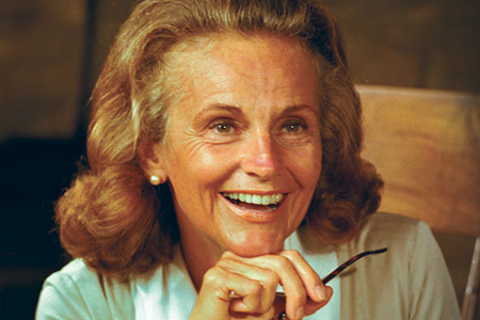 Ruth Bell Graham, wife of evangelist Billy Graham, was born at Qingjiang, Kiangsu, China, on June 10, 1920, as Ruth McCue Bell. Her parents, Dr. and Mrs. L. Nelson Bell, were medical missionaries at the Presbyterian Hospital 300 miles north of Shanghai. As a young girl there in the small hospital compound, Ruth first sensed the great calling to abandon all for the sake of the Gospel of Jesus Christ. Her childhood was spent on China’s mission field with her parents and siblings Rosa, Virginia, and Clayton, surrounded by disease, despair, and the eventual disorder and chaos of civil wars. The suffering she observed only strengthened in her the conviction of mankind’s need for the Saviour. Until her early adult years, she dreamed of serving as a single missionary in a far corner of the world — the mountainous nation of Tibet. At the age of 13, Ruth was sent to boarding school in Pyongyang, in modern-day North Korea, where she studied for three years. Under terrible homesickness, Ruth learned to overcome the loneliness of being far from loved ones by taking care of the needs of others, a skill that would serve her well in the coming years. Ruth completed her high school education in Montreat, North Carolina, while her parents were there on furlough. In the fall of 1937, she enrolled at Wheaton College, outside Chicago, Illinois, and three years later was introduced to “Preacher,” the nickname other students gave the strapping Billy Graham from Charlotte, North Carolina. The couple began courting, and so also began a struggle in Ruth between what she thought was her calling to the mission field and her blossoming love for the driven young evangelist. In late April 1941 after much struggling in prayer, Ruth realized her life’s mission was to be bound up in Billy’s passion for evangelism. Shortly after their graduation from Wheaton, the two were married in Montreat on August 13, 1943. For a brief period, Ruth served as a pastor’s wife in Western Springs, Illinois, before Billy moved on to serve as an evangelist with Youth for Christ; as president of Northwestern Schools in Minneapolis, Minnesota; and eventually as evangelist and president of the Billy Graham Evangelistic Association. With their increased time apart due to frequent preaching trips — and with their first child on the way — Ruth convinced Billy to move the family to Montreat, near her parents. Ruth’s ministry flourished in the mountains of western North Carolina, where she built the family homestead and raised five children: Virginia (Gigi), Anne, Ruth, Franklin, and Nelson Edman (Ned). Ruth treasured her role as the strong woman behind “America’s Pastor” and was Billy’s closest confidant, most trusted advisor, and dearest friend. She loved to move behind the scenes, away from the spotlight, and helped him craft and research sermons and even books.